Researchers from the Mechanobiology Institute (MBI) at the National University of Singapore (NUS) have revealed the molecular events leading to the regulation of cell growth and proliferation in response to stiffness of the extracellular matrix that surrounds them. This study was published in the scientific journal PNAS on 14 October 2016. It is becoming increasingly clear that cells react to the mechanical properties of their immediate micro-environment, which is essentially a molecule-based scaffold called the extracellular matrix (ECM). A greater emphasis is now being placed on how ECM properties, such as its stiffness, shape, and curvature, can influence fundamental cellular behaviours; in particular the ability of a cell to grow, proliferate, adopt specialised functions and move around. In many cases, researchers are able to see a story emerge, where a cell becomes aware of its surroundings, and responds in a particular way. In many of these stories however, we can only see the start and end of a highly complex series of events; the intermediate molecular events that connect the mechanical signals to the cellular response remain largely unclear. Unravelling the molecular story that unfolds when a cell responds to one ECM property – its stiffness – was the focus of a study led by MBI Director, Professor Michael Sheetz, and Postdoctoral Fellow, Dr Naotaka Nakazawa. In this case, they were particularly interested in how ECM stiffness influences the synthesis of proteins related to cellular proliferation. As their story developed, a main character emerged; a protein called FHL2, and a specific molecular event; its relocation from sites near the cell membrane to inside the nucleus. 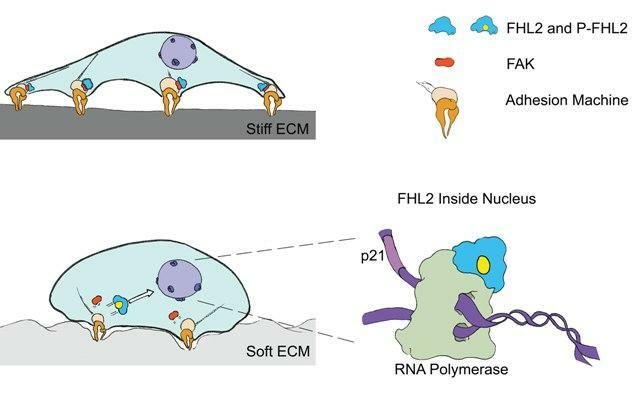 At the membrane, FHL2 helps the cell attach to the ECM and receive mechanical signals, however once inside the nucleus it binds to specialised molecular machinery on the DNA, and drives the decoding of genes. By using advanced laboratory techniques such as atomic force microscopy to measure the stiffness of the ECM, and super-resolution imaging to visualise the sub-cellular location of individual proteins, the researchers revealed that the movement of FHL2 into the nucleus would only occur if the cell was unable to apply enough force onto the ECM. In other words, FHL2 moved into the nucleus when cells were surrounded by a soft ECM, or when cells were unable to generate enough force to move against the matrix. At this point in the story, it became clear that the transport of FHL2 to the nucleus could only occur if the protein was chemically modified first. This modification was carried out by another protein called Focal Adhesion Kinase (FAK) in response to changes in the mechanical forces surrounding the cell. Once inside the nucleus, FHL2 was free to carry out its role in helping decode the DNA, which in this case was to turn on the synthesis of a specific protein called p21, an inhibitor of cell growth and proliferation. Erratic cell growth in soft environments is associated with cancer cell proliferation and tumour growth. For a healthy cell to detect a soft environment, and ensure erratic cell growth does not occur, it requires proteins like FHL2 to mediate the production of proteins like p21. While this story ends with the protective action of FHL2 against cancers, in other cases its prominent role in cell signaling becomes a double-edged sword. For example, in breast and ovarian cancers, FHL2 is known to counteract mechanical signals and promote cancer cell growth and metastasis. It is therefore imperative that research continues to dissect the molecular pathways involving this protein. With the story of how FHL2 suppresses the growth of healthy cells in soft environments now told, it is hoped that researchers can probe why it behaves differently in cancer cells and whether targeting these molecular events can prove beneficial to cancer patients.